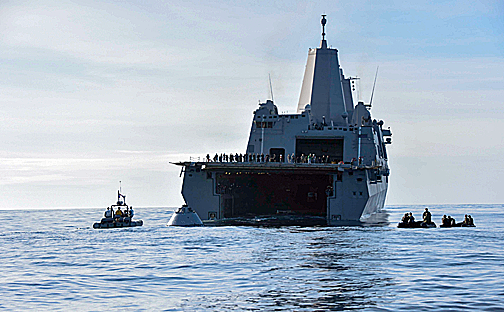 San Antonio-class amphibious transport dock USS Anchorage (LPD 23) successfully completed test recovery operations of NASA's Orion test article on January 23. 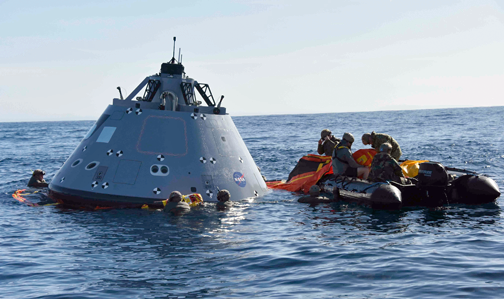 The Underway Recovery Test-6 (URT-6) is part of a U.S. government interagency effort to safely retrieve the Orion crew module, which is capable of carrying humans into deep space. This marks the fourth completion of a URT aboard Anchorage. NASA engineers worked alongside Sailors from the Anchorage, the San Antonio-class amphibious transport dock USS New Orleans (LPD 18), Special Boat Team 12 and Navy divers from Explosive Ordinance Disposal Mobile Unit 3 to test recovery operations of the Orion test article. Tests were conducted in varying sea states, during the day and at night. U.S. Navy divers from Explosive Ordnance Disposal Mobile Unit (EODMU) 3 attach an inflatable ring to NASA's Orion test vehicle to the San Antonio-class amphibious transport dock ship USS Anchorage (LPD 23). Anchorage is underway to support NASA's Orion spacecraft Underway Recovery Test 6 (URT-6). U.S. Navy photo by Mass Communication Specialist 3rd Class Natalie M. Byers. With their main role of conducting amphibious operations, San Antonio-class ships have unique capabilities that make them an ideal partner to support NASA's mission. 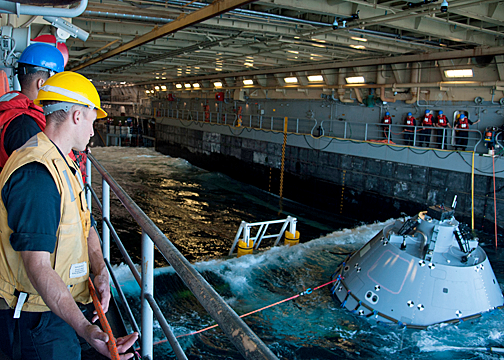 One of the more important capabilities is the ship's ability to recover the test capsule using the ship's well deck, which was designed to launch and recover amphibious craft. Anchorage also has the ability to carry and deploy multiple small boats to aid in the recovery process of the capsule and contains an advanced medical facility ideal for treating the returning astronauts. URT-6 consisted of releasing the test capsule from the well deck, then carefully maneuvering the ship alongside the capsule at slow speed. Once the test article was far enough from the ship, the lines attaching the capsule to the ship were released. Then, divers attached a stabilization ring designed by NASA that would help in sustaining the astronauts in the capsule for up to three days. Divers then removed the collar, attached lines from the small boats to steady and guide the capsule toward Anchorage, where Rigid Hull Inflatable Boats (RHIB) would then assist in attaching lines from a NASA-designed winch which then hauled the capsule into the well deck. The San Antonio-class amphibious transport dock ship USS Anchorage (LPD 23) pulls in NASA's Orion test vehicle with the assistance of Sailors from USS New Orleans (LPD 18) and Navy divers from Explosive Ordnance Disposal Mobile Unit (EODMU) 3. The entire recovery is a high risk evolution, especially when the capsule is being towed closely behind the ship, but NASA took our inputs and modified the equipment for this URT mission," said Chief Petty Officer Beau Lontine, a Navy diver assigned to Explosive Ordnance Disposal Mobile Unit 3. "There are so many things that could go wrong if just one person isn't paying attention. We've conducted training with the hardware and rigging to allow for a safe recovery of the capsule. It might seem like a basic recovery, but it is far from a simple evolution." The tests allowed NASA and the Navy to continue to demonstrate and evaluate the recovery processes, procedures, hardware and personnel in real, open-ocean environment before conducting actual recovery operations. URTs have been conducted since 2014 and will continue to operate until NASA engineers believe the recovery process is without error. The next URT, URT-7, is scheduled to be on the San Antonio-class amphibious transport dock USS Somerset (LPD 25) in October of 2018 when NASA will conduct the validation and verification of the recovery hardware. According to NASA's Recovery Director Melissa Jones, future tests will ensure NASA and the Navy arrive at a safe and more efficient way to recover the capsule for an early 2020's mission involving a flying crew. Seaman Marc Castillejo handles a line from NASA's Orion test vehicle aboard the San Antonio-class amphibious transport dock ship USS Anchorage (LPD 23). U.S. Navy photo by Mass Communication Specialist 2nd Class Carrel Regis. Captain Dennis Jacko, Anchorage commanding officer, reported that the crew has actually been training for several months closely with NASA on everything from planning conferences to onsite training to be ready for the mission. I think the ship and the crew are doing a great job for a historic tasking that has been added to a very busy schedule as deployment preparations continue. Also aboard Anchorage to observe the URT for the first time is NASA Astronaut Stephen Bowen, who is also a retired Navy captain. He stated that he is very pleased with what he's seen so far. The reason these testes are done is to better understand the mission. There will be changes made; things are going to evolve and they should get better over time. The Orion spacecraft is designed to meet the evolving needs of our nation's deep space exploration program for decades to come. It will serve as the exploration vehicle that will carry the crew to space, provide emergency abort capability, sustain the crew during the space travel and provide safe re-entry from deep space return velocities. Anchorage is home ported in San Diego and is part of U.S. 3rd Fleet. Third Fleet leads naval forces in the Pacific and provides realistic, relevant training necessary for the global Navy.